Imagine standing at a US airport gate like JFK or LAX or any for that matter. The boarding time has been posted. Precisely one minute before, all airline agents move to the jetway entrance. A welcome announcement is made for the flight. Then in unison the 10 or so gate agents bow to their guests and boarding commences. Yeah, that will happen in the US, sure. But it does happen. 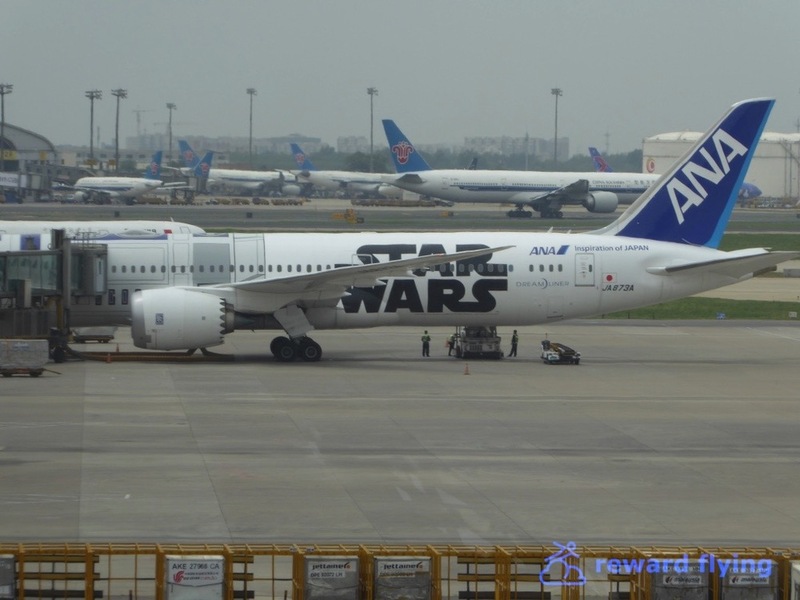 It happened in Seoul South Korea at Gimpo Airport on an ANA flight I took from GMP to Tokyo’s Haneda Airport. Out of respect for them, as this is not a spectacle, I did not take a photo of their welcoming gestures. However here is the ground crew, as is customary, waving goodbye and bowing to the departing aircraft. Wouldn’t it be nice if the rest of the world had this kind of respect for others? While Icheon Airport in Seoul gets all the accolades, their regional airport Gimpo, is amazing as well. An easy journey using the subway you arrive at the airport subway station (where you can connect to Icheon airport), then a short walk underground from the subway station into the airport. The terminal itself is fairly small. Typical for a major city’s second regional airport. 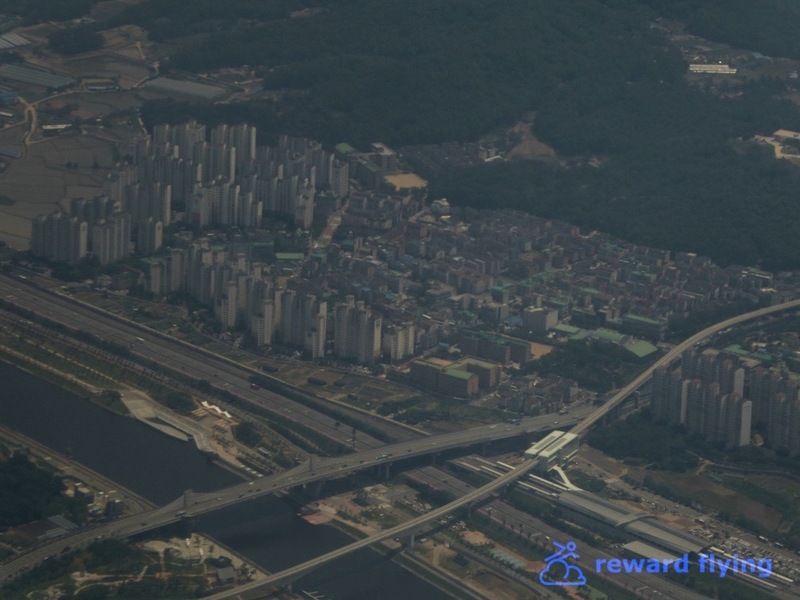 Back in 2003 Gimpo began limited international flights starting with Tokyo. 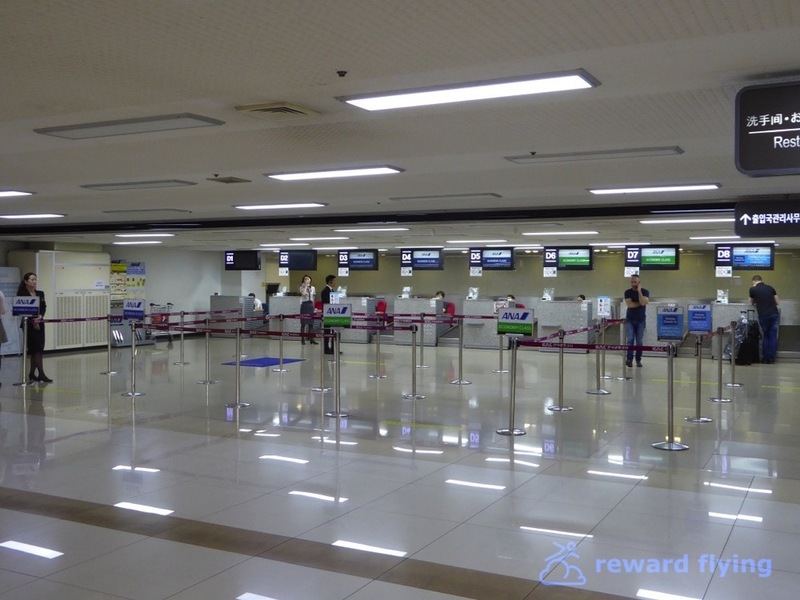 Now there is an international terminal, It looks pretty new and was...empty. 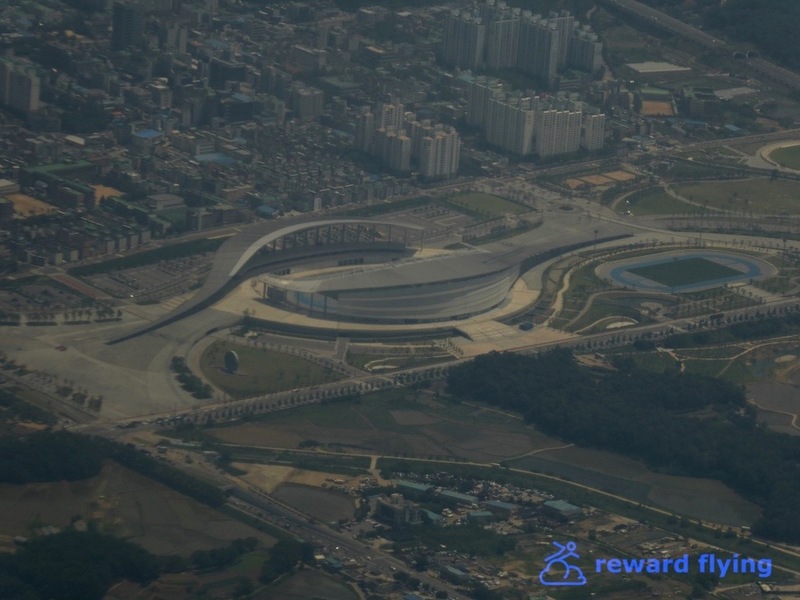 If traveling to Seoul, this airport is far easier to transit to the city than Icheon. 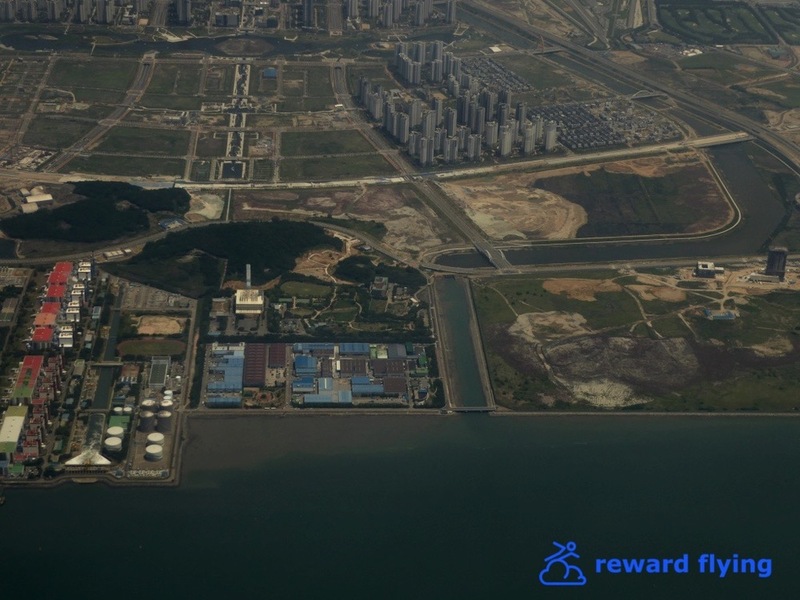 So if you can't get a direct flight to Icheon, don't be shy about a connection to GMP. This was part of my trip back to the states. 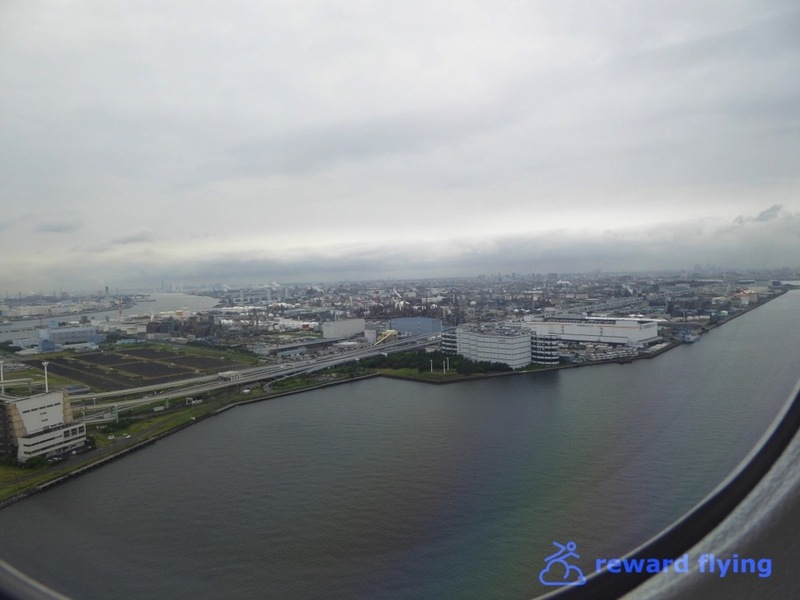 I wanted to fly Air Canada’s 787 and the flight was out of Tokyo's Haneda airport so got this connection. Originally a 777-200 route, the aircraft was switched to a 787 making my trip back all 787. Sometimes luck is on your side. The retail fare for this flight was about $400, one way. If you wanted to use Mileage Plus points it will set you back 30,000 for a redemption value of 1.33 cents. The lounge ANA uses for their 3 flights a day out of GMP is the Asiana lounge. It was a nice lounge in terms of comfort and was empty as well. 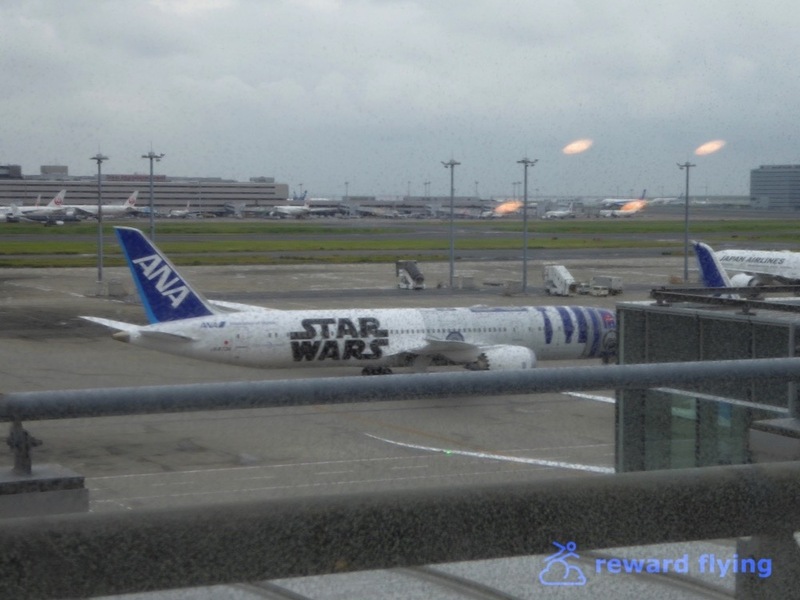 The only international flight leaving at the time was this ANA flight. 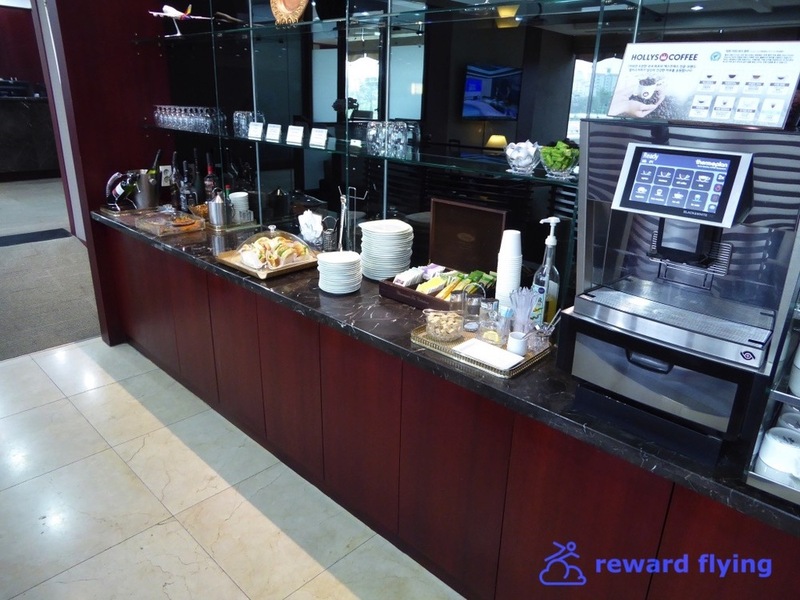 Food selection was limited, expresso machines made your coffee and you had a view city in the distance. This ANA 787 had their business class cradle seating. These jets are used regionally, which of course this flight was, but are also used on some long haul flights like to Vietnam, Indonesia as well as recently to San Jose and Vancouver (Always check the seat map!). Seating is 2x2x2. On this flight the cabin was full, except for the seat next to me. Because of all the passengers I didn’t get a good cabin photo. There are two business class cabins on the 787, one before the second door and a smaller 3 row cabin aft the door. 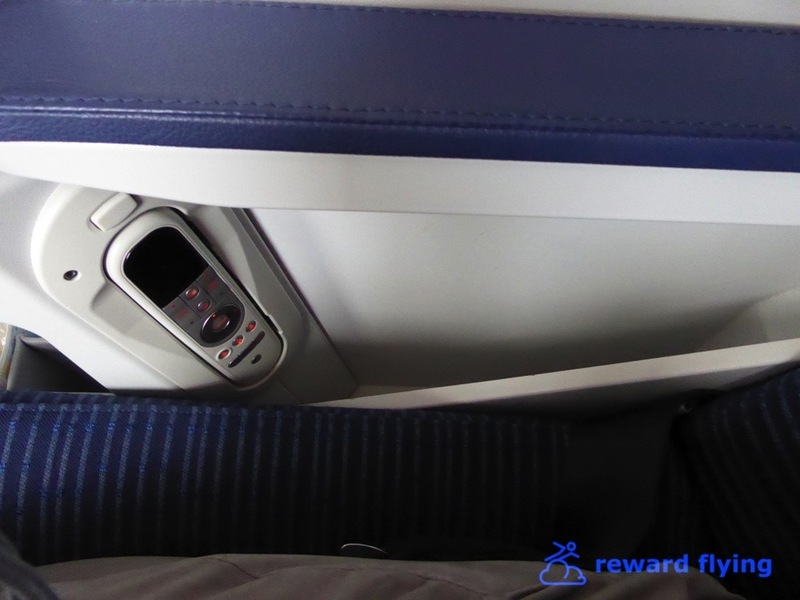 Bulkhead seats have the IFE monitor stored under the tray table that separates the two seats. Lift it out to view. This was a popular style when monitors were first introduced. The advantage here is that it’s closer compared to the other seats with the monitor in the seat-back. 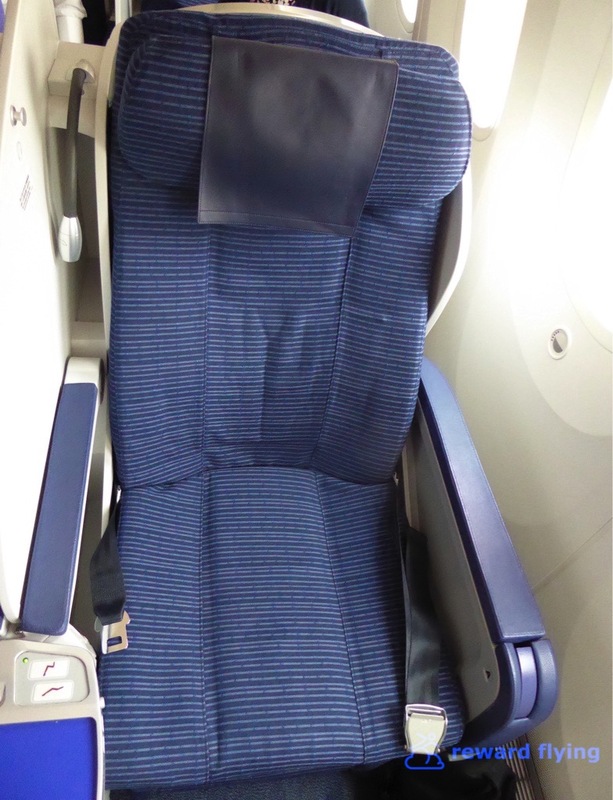 Of course you have less storage with these seats and you can see the bassinet clips on the bulkhead wall. The issue was, there wasn’t much space, it was confined. 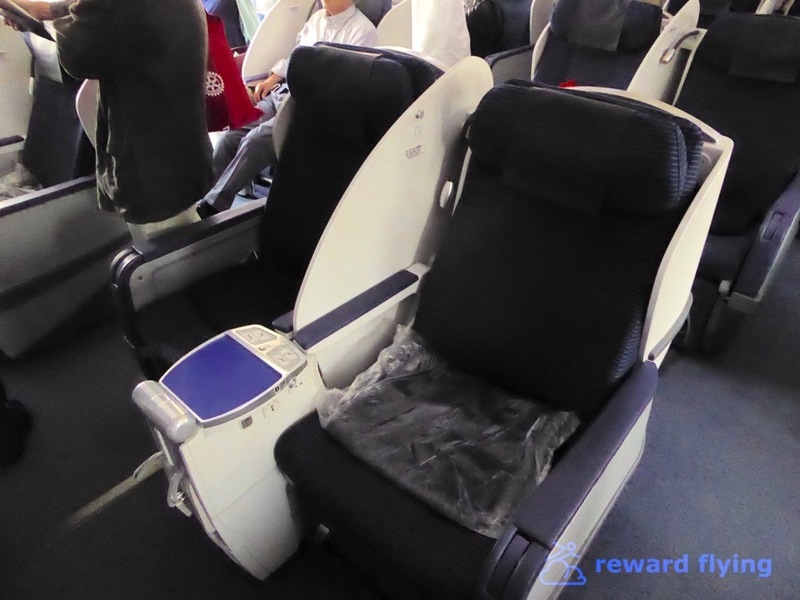 The large non-reclining partition, while providing some privacy, took up all the room leaving only a small table and side seat compartment to place any items you might use during a flight. For example, if you had a laptop there wasn't any place to put it other than the tray table. Device jacks were located above the little storage compartment (that had not been cleaned). A larger person might might bump against any cables that were engaged. Off your shoulder is a hook for headphones and a reading lamp. 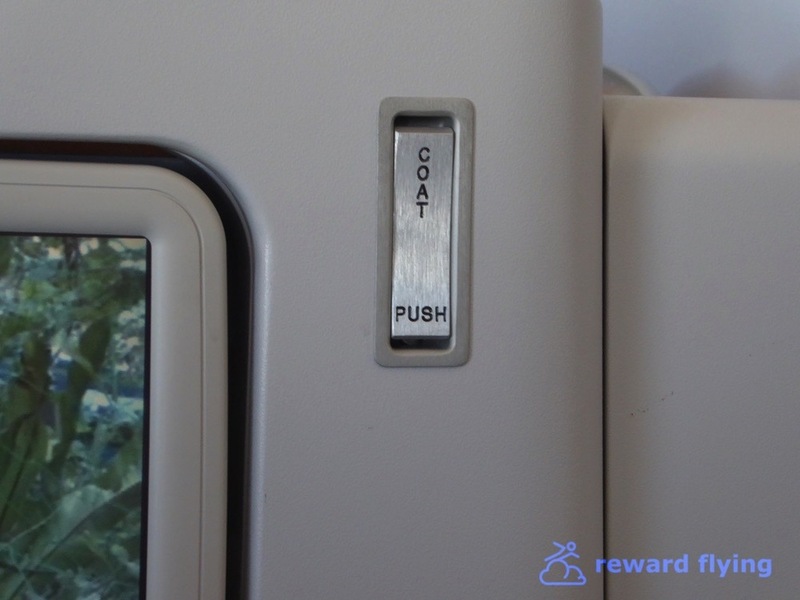 A coat hook is located on the seat-back next to the monitor in front of you, unless you are in a bulkhead row. The seat-back houses a small 12 inch monitor. Next to the footwell of the seat if front is a vertical storage slot for printed items. On this flight printed items had been stuffed into the pouch below the monitor along with the headphones, an immigration card assuming you could fish it out and some discarded paper wrappings that I found. A nice size tray table is really the only place to put stuff. As the name cradle implies, these seats are recliner seats, not angled lie-flat. Again, fine for a short haul route, but more than say 4-5 hours, if you wanted to sleep fully reclined you're out of luck. 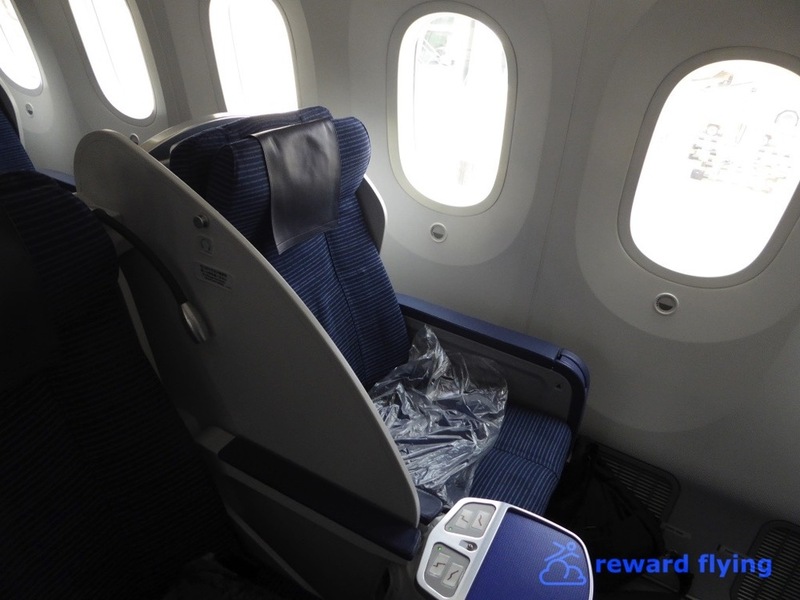 While the ANA staggered business class seat is outstanding, the cradle seat has more to dislike than like, in my opinion. Oddly, in the messy pouch was a seat guide for the 787 business class staggered seat. The menu contained a large selection of beverages including champagne, a Chardonnay and Bordeaux. Menus were in the forward seat pouch. It’s a 3 month menu that changes the single offering twice per month. Like airlines used to do with movie selections before AVOD. It took a while but I finally located today’s lunch. Whitefish persillade-style with green olive sauce. Not being a green olive fan I was skeptical and it was the only choice. ANA is not big on presentation. Meals (as was my prior ANA meal NRT-SIN) are served on a plain black tray. But first instead of customary nuts, how about a rice cake? Ok so now, I have this aluminum foil meal with a cover. Where do I put the cover? While the plate of food doesn’t have a visual appeal at all, it was actually pretty good. 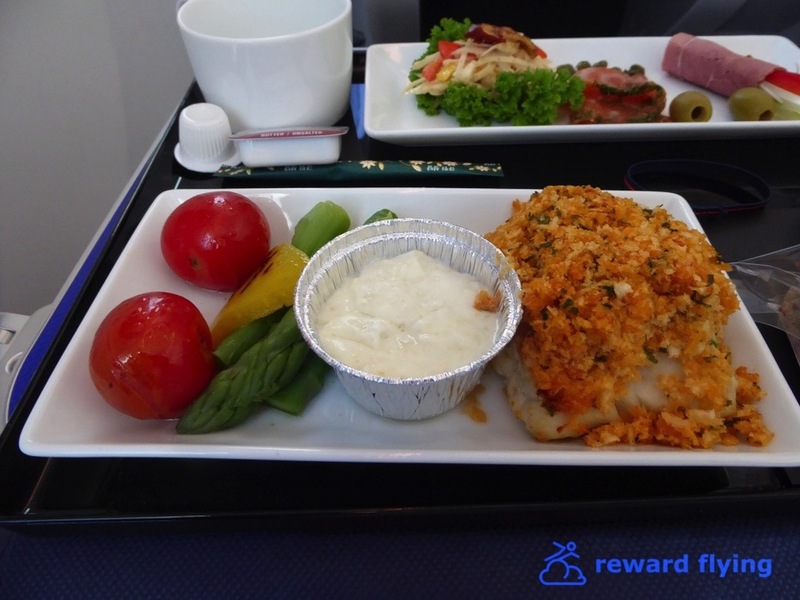 For the second time in a row I’m amazed at how ANA prepares fish on a plane. The whitefish was moist, flaky and tender. The stuff on top wasn’t as bad as it looks. Finally I bring your attention to one minor detail. The menu suggests corn roll and Petit Four. Do the items on the tray have any resemblance to that? Nothing special here. I watched the airshow, which was shown on cabin monitors as well. I dislike seat-back monitors that are so far away. 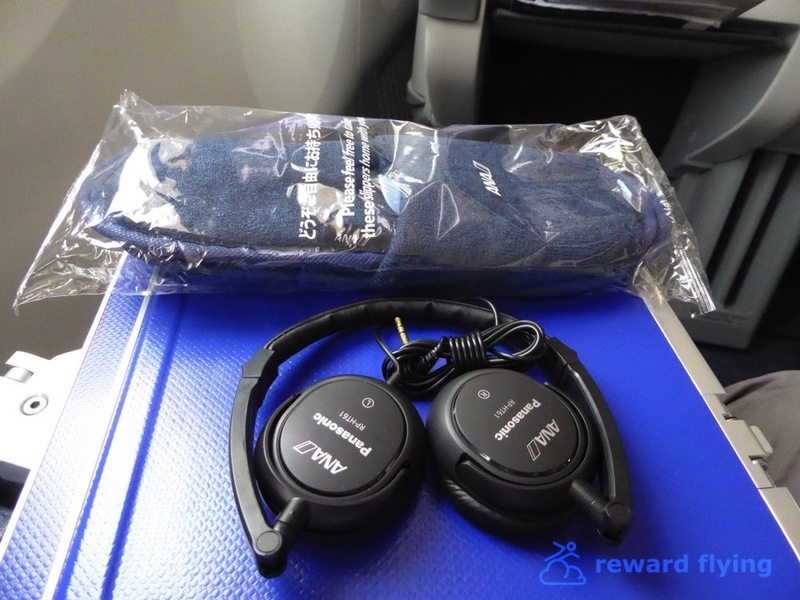 Headphones were provided as well as slippers, which are a nice touch the US domestic carriers would never do for an hour flight. I did not try to connect as the flight was too short. Price? Flight attendants were quite nice and respectful as well. A friendly greeting as I boarded. One took a photo of me which surprisingly is not getting posted. But things like not taking the lid from the meal tray and the messy seat reduced their rating a little. The Boeing 787 is a beautiful aircraft. It’s spacious, quite and the windows are great for viewing. 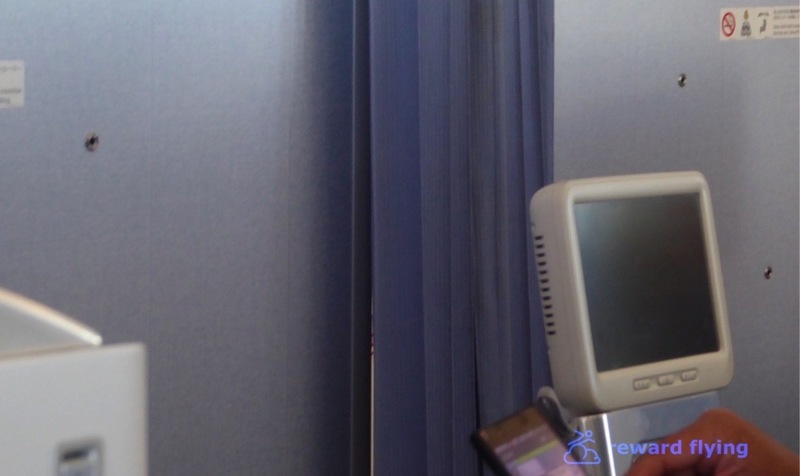 Get a window seat! This photo is the window dimmed to the middle level. I like ANA very much. Maybe I’m being too critical for an hour flight, as compared to a US one hour flight this was 10 stars. I will not hesitate to fly ANA at any time. Do you have any ANA experiences you'd like to share? Feel free to leave a comment.